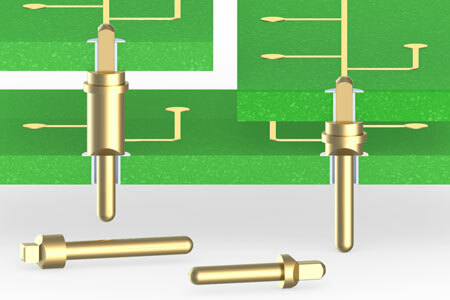 We have expanded our PCB pin offering with four new pins specifically designed for press-fit into PCB plated-through holes, providing a secure connection while maintaining plated-through hole integrity and continuity. These new PCB pins incorporate square press-fit geometry and angled vent features making them suitable for solderless press-fit or press-fit and solder PCB termination. The four new pins are double tail header pins featuring a square press-fit shank, a round tail and a standoff body in between. When these pins are pressed into a plated through hole the points (the major or circumscribed diameter) of the square are set or imbedded in the hole while the flat sides of the feature (minor or inscribed diameter) provide relief, allowing the remainder of the plated through hole barrel to remain intact. The result is internal board layers are not disconnected when the pin is pressed in. With a properly specified hole size, the polygon shaped press-fit feature will allow the pin to be secured in the hole while maintaining continuity throughout all the layers of the PCB. The pins offered here are samples of the many configurations that can be manufactured; the table above provides some details of their features. For more information use the links to the right for additional product details, to order a sample, or to find related products.